Thomas Sangiovanni scored off an assist from Aiden Costello with 1:45 left to break a tie at 10 and lead Harborfields over Whitman in a non-league boys lacrosse game Monday afternoon. 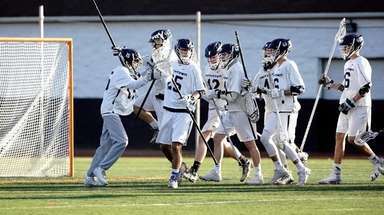 Harborfields led 9-6 at the end of the third quarter before Whitman scored four consecutive goals. Danny Alnwick scored off a pass from Sangiovanni to tie the score at 10. 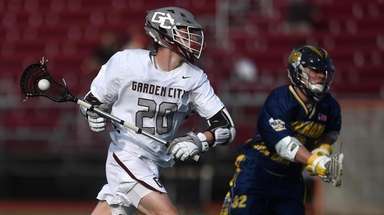 Jonathan Osmun had three goals and two assists, and Nick Caccamo had 10 groundballs and an assist for Harborfields. Luke Brennan made 13 saves for Whitman. Riverhead 11, Bayport-Blue Point 10: Caleb Zuhoski scored the game-winning goal on a man-up play with six seconds remaining off an assist from Shane Coleman to lead Riverhead in a non-league game. Jameson Smith knotted the score at 10 off an assist from James Ringer with 4:08 left in the fourth quarter for Bayport-Blue Point. Kings Park 8, Sayville 7: Eddie Montemurro scored the game-winning goal with 15 seconds remaining to lead Kings Park in a non-league game. Jack Quaranto knotted the score at 7 off an assist from Montemurro with 45 seconds left in the fourth quarter for Kings Park. Christian Michaels made 17 saves for Kings Park. Islip 10, Connetquot 7: Joe Juengerkes had four goals and one assist to lead Islip (1-1) in a non-league game. Devin DeGennaro had nine saves for Islip. Miller Place 8, Babylon 7: Ava Burns scored the game-winning goal with 18 seconds left in the second OT to lift Miller Place to a season-opening, non-league victory. Burns, Maddie Murphy and Lauren Mancini all scored two goals in the victory. Emma Ward scored three goals for Babylon, including the game-tying goal with eight seconds left in regulation. 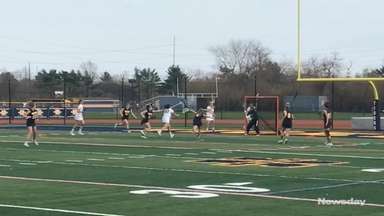 Calhoun 15, Floral Park 14: Sofia Mescolotto (four goals, one assist) scored with seven minutes remaining to give Calhoun a 13-12 lead in a non-league win. Sarah Tapetto (three goals) scored the final two goals to secure the victory. Rylee Raines and Kerri Keener each had four goals, Olivia Correa had four assists and Lauren Boldis made 13 saves for Calhoun. 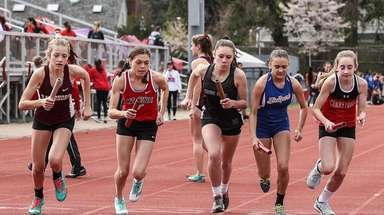 Amanda Kozak had eight goals and three assists for Floral Park. Bay Shore 12, Islip 8: Ali Susskind had four goals and Lauren Hendricks had a goal and four assists to lead Bay Shore in its non-league opener. Newfield 19, Southampton 3: Amanda Baez hit two grand slams in the fifth inning to lead Newfield in a non-league game. The score was tied at 3 after four innings, before Newfield scored 16 runs in the fifth. Kayla Colabella was 4-for-5, hit for the cycle and led off the game with a home run for Newfield. 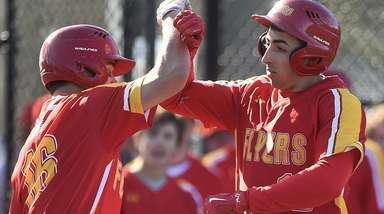 Deer Park 9, Brentwood 6: Kelly Rennert went 3-for-4 with an RBI and three runs scored to lead Deer Park in a non-league game. Taylor Quinones struck out 10 and earned the win and Alyssa Rosano went 3-for-4 with an RBI for the Falcons. Connetquot 10, Central Islip 4: Bella Andres struck out five and allowed five hits in seven innings to earn the win and lead Connetquot in a non-league game. Isabella Lindsay went 3-for-4 with two RBIs and Julianna Levanti went 2-for-4 with four stolen bases and two runs in the win. Patchogue-Medord 4, Middle Country 3: Alex Cajamarca defeated Rayan Jones, 0-6, 6-2, 6-1, at fourth singles to lead Patchogue-Medford in Suffolk VI.